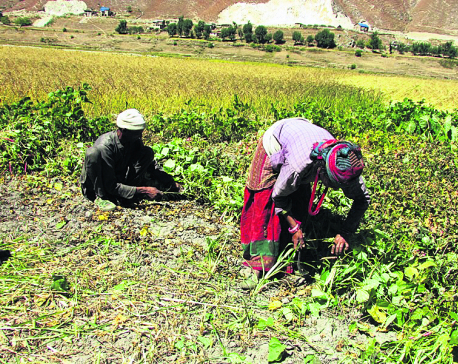 DHADNG, April 29: A sudden gust followed by heavy rainfall and hailstorms this week destroyed much of the crops and vegetables in Dhading district. Especially Gajuri Rural Municipality ward 7 and 8 have been hit the most. 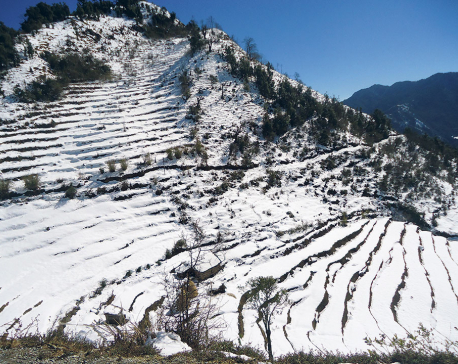 Adhikari had cultivated maize and vegetables including tomatoes and cucumbers in 15 ropanis of land. As the yields were damaged away by hailstones just before plucking, farmers have requested the government to provide them relief. Farmers who are largely dependent on agriculture for livelihood are deeply worried following the loss. “We hope the government would provide us relief for our survival,” said Adhikari. Villages of Gajuri-7, such as Kupindey, Dadagaun, Shayamdanda and villages of ward 8 including Barbhanjyang, Katunje, Majuwa among others have been hit the hardest. From both the wards, crops planted in around 300 ropanis of land have been destroyed, according to ward-7 Chairman Keshav Adhikari. He further informed that they are yet to collect the full details. Chairman of Gajuri-8 Raj Kumar Dhungana said the rain and hailstones have also caused damages to the road network. “A road that was dug during winter has been ruined. Now, it is very muddy and in pathetic condition,” he said. Chief of the rural municipality, ward chairman and technicians from District Agriculture Development Office recently concluded a field visit to inspect the loss. The rural municipality informed that data would be collected very soon. According to ward-8 chair Adhikari, discussions are underway with agriculture development office and the rural municipality regarding distribution of relief to the affected farmers. Agriculture yields produced from the areas are collected and sold in Kathmandu, Chitwan, Pokhara and other parts of the country.